Toyota Research Institute (TRI) has released a video showing the first demonstration of its Guardian and Chauffeur autonomous vehicle platform. The video shows the advances TRI has made with Platform 2.1, the next iteration of TRI’s innovative advanced safety research vehicle for autonomous driving, conducting several test maneuvers on a closed course. Platform 2.1 is the first research tool for testing both Guardian and Chauffeur systems on a single vehicle using the same technology stack of sensors and software. Chauffeur is Toyota’s testing version of SAE Level 4/5 autonomy where the automated system is responsible for all driving tasks, while in Guardian mode, the automated driving system acts as a safety net for the human driver to help prevent an accident. In the video, the Chauffeur scenarios demonstrate the test vehicle’s ability to drive itself on a closed course and navigate around road obstacles. The “Truck with Hay Bales” test shows how the car can detect unexpected objects in its path and make safe lane changes to avoid obstacles. “The Blocking Car” is a scenario in which the Chauffeur system detects a stalled vehicle in its path and another vehicle travelling at the same speed in the lane next to it. Here, the system slows the test vehicle down to let the adjacent vehicle pass and makes a safe lane change around the stalled vehicle which is followed by the vehicle returning to the original lane of travel. The Guardian tests show the system’s ability to protect the vehicle and its occupants when the test vehicle encounters a potentially hazardous situation and takes action if the driver does not react. The Guardian system also monitors the driver’s eyes for distracted or drowsy driving. In “The Drowsy Driver” scenario, the Guardian system detects the driver falling asleep at the wheel as the vehicle approaches a curve in the road. When a driver closes his or her eyes and does not steer with the road’s curvature, the system steps in and steers the car to keep it in the lane of travel. The second Guardian scenario, “The Reveal,” shows how the system can detect debris in the road ahead of a vehicle in front of it that the driver may not see. When the vehicle ahead swerves out of the way, the Guardian system perceives the obstruction ahead and takes over for the driver to steer the car out of the way, retaining control until the driver is able to take back control of the car. On Platform 2.1, TRI created a second vehicle control cockpit on the front passenger side with a fully operational haptic drive-by-wire steering wheel and pedals for acceleration and braking. 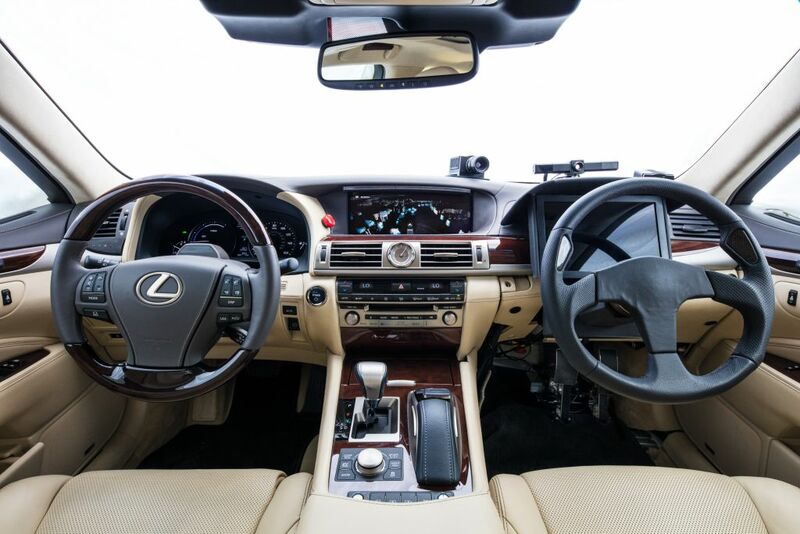 This dual-cockpit setup allows for experimentation of effective methods to transfer vehicle control between the human driver and the autonomous system. It also supports the development of machine learning algorithms that can learn from expert human drivers and provide coaching to novice drivers. An alert system in Guardian mode that warns the driver of impending danger and prompts the driver to take back control after the Guardian system takes corrective action. Toyota Research Institute is a wholly owned subsidiary of Toyota Motor North America under the direction of Dr. Gill Pratt. The company, established in 2015, aims to strengthen Toyota’s research structure and has four initial mandates: 1) enhance the safety of automobiles, 2) increase access to cars to those who otherwise cannot drive, 3) translate Toyota’s expertise in creating products for outdoor mobility into products for indoor mobility, and 4) accelerate scientific discovery by applying techniques from artificial intelligence and machine learning. TRI is based in the United States, with offices in Los Altos, Calif., Cambridge, Mass., and Ann Arbor, Mich. For more information about TRI, please visit tri.global.